With Arizona’s harsh new immigration law threatening to unleash a wave of racial profiling, Bay Area African-American clergy and community leaders traveled to Phoenix late last month on a four-day solidarity mission. The pastors joined community and faith leaders from across the country for a huge march on Arizona’s capitol and strategized with local ministers and former freedom summer organizers. 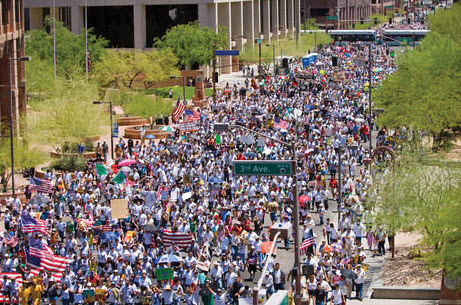 Underscoring the urgency of their work, news reports revealed this week that extremist Arizona legislators’ next target is the 14th Amendment, which helped end slavery by guaranteeing citizenship for all born on U.S. soil. Arizona Republicans want to undermine the amendment by denying birth certificates to children born in Arizona whose parents, due to the nation’s broken immigration system, lack legal status. While in Arizona, the group toured detention centers where immigrants are imprisoned, held a press conference at the state capitol and met with Rev. Warren Stewart of Phoenix’s First Institutional Baptist Church. Stewart helped lead the fight to win recognition for MLK Day and opposes the discriminatory SB 1070. The delegation also discussed plans for a 2010 Arizona “freedom summer” with three civil rights organizers of the original 1964 Mississippi Freedom Summer and 20 other ministers from African American and Latino communities. Making the journey to Arizona were Rev. Phil Lawson; Pastor BK Woodson, Bay Area Christian Connection, Oakland; Rev. Gregory Brown, Miracles of Faith Community Church, Oakland; Rev. Jethroe Moore, president, NAACP San Jose/Silicon Valley Chapter; Gerald Lenoir, executive director, Black Alliance for a Just Immigration; and Linda Burnham, activist and writer. Interfaith Committee for Worker Justice, Black Alliance for Just Immigration and East Bay Housing Organizations co-organized the delegation. Previous articleA repeat of Rodney King verdict?